Some of the company's most famous hues are available for purchase. If a run-of-the-mill BMW just doesn't feel special enough, perhaps one of the automaker's Individual paint colors will add that extra bit of flare. For a sizable fee, the BMW Individual program allows buyers to choose from practically any color they can dream up, including legendary hues from past M cars. BMW offers its own pre-chosen Individual colors on models like the 7 Series and X7, which are typically less pricey but not nearly as expansive or vibrant. Although the return on investment may not be very high, we love the idea of picking from a limitless catalog of past BMW colors. To help buyers choose a color, BMW has created a configurator for the new 2020 3 Series, which will let you build the car in one of 87 different paint colors. Most of the options are completely outrageous with past M colors we recognize including Le Mans Blue (E39 M5), Estoril Blue (E36 M3), Laguna Seca Blue (E46 M3), Fire Orange (E92 M3 Limerock Edition), Imola Red (E46 M3), Austin Yellow (F82 M4), Sakhir Orange (F82 M4), Daytona Violet (E36 M3), and Oxford Green (E39 M5). Certain colors also come from rival automakers like Porsche's Riviera Blue, Miami Blue, Mexico Blue, Speed Yellow, and Mint Green. There's also Rosso Corsa from Ferrari, Nardo Grey and Goodwood Green Metalic from Audi, and Verde Mantis from Lamborghini. The configurator also lets you play around with wheel and interior options to match the exterior. 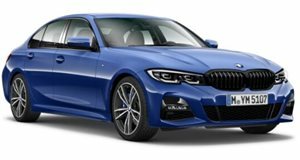 As of now, the most expensive 3 Series available on the configurator is the new 330i because the M340i and M3 have yet to go on sale in the US. If a four-cylinder 3 Series just doesn't feel special enough to justify spending big bucks on a custom paint color, you can also opt for an M4, M5, or M850i in one of these awesome shades.